Buying an apartment or villa in Istanbul Turkey involves a number of steps, most of which aren’t possible to complete unless you’re in Turkey and can speak Turkish. That’s why it’s a good idea to grant power of attorney in Turkey to a solicitor in Turkey to act on your behalf, completing transactions and checking to see how the Turkey property procedure is progressing. – make legal claims or conduct litigation. The terms stating what an agent can and cannot do should be plainly and clearly stated in the document. Before you grant power of attorney, check that your solicitor is a member of the local Lawyer’s Barr Association. If your chosen agent is not a solicitor, make sure you obtain professional references. To grant power of attorney the principal (the person delegating authority to another) will need to complete the document in the presence of a notary. This does not have to be in Turkey you can do it at your local Turkish consulate. However, the document must be notarised by a notary public or solicitor. The documents must also be translated into Turkish and English and notarised. You may revoke power of attorney at any time by contacting a notary or a Turkish consulate. Send a written notice to your agent informing them that the document has been revoked, and request that all copies of this document are returned to you. Contact your bank and any other institutions and let them know the document has been revoked. – General power of attorney, which gives a general right to represent you legally in all matters, where your signature and approval may be needed. 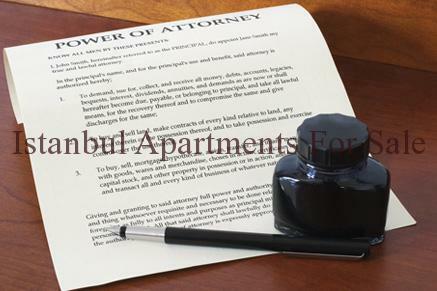 – Specific power of attorney, which gives a specific right to a third party/solicitor to represent you in a specific transaction such as purchase of real estate in Turkey. Generally speaking, specific power of attorney is granted when buying property in Turkey.